Maximum Steel Met. Clear Coat exterior, Express trim. 4x4, Back-Up Camera, iPod/MP3 Input, Alloy Wheels, TRANSMISSION: 8-SPEED AUTOMATIC (845R... POPULAR EQUIPMENT GROUP, QUICK ORDER PACKAGE 22J EXPRESS, Tow Hitch, ADD CLASS IV RECEIVER HITCH, ENGINE: 3.6L V6 24V VVT. Warranty 5 yrs/60k Miles - Drivetrain Warranty; AND MORE! KEY FEATURES INCLUDE 4x4, Back-Up Camera, iPod/MP3 Input, Aluminum Wheels. MP3 Player, Privacy Glass, Child Safety Locks, Heated Mirrors, Electronic Stability Control. OPTION PACKAGES QUICK ORDER PACKAGE 22J EXPRESS Engine: 3.6L V6 24V VVT, Transmission: 8-Speed Automatic (845RE), Fog Lamps, Ram 1500 Express, Body Color Grille, Body Color Rear Bumper w/Step Pads, Rear Floor Mats, Body Color Front Fascia, Front Floor Mats, POPULAR EQUIPMENT GROUP Remote Keyless Entry w/All-Secure, SiriusXM Satellite Radio, For More Info, Call 800-643-2112, No Satellite Coverage w/AK/HI/PR/VI, 1-Year SiriusXM Radio Service, ADD CLASS IV RECEIVER HITCH, TRANSMISSION: 8-SPEED AUTOMATIC (845RE) (STD), ENGINE: 3.6L V6 24V VVT Flex fuel capable (STD). EXCELLENT SAFETY FOR YOUR FAMILY Brake Assist, 4-Wheel ABS, Tire Pressure Monitoring System, 4-Wheel Disc Brakes BUY FROM AN AWARD WINNING DEALER When you visit our Sodus, NY new and used Chrysler, Dodge, Jeep, Ram and FIAT dealership your satisfaction is our primary concern. 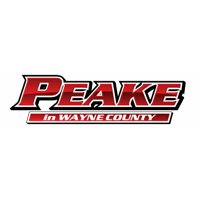 If you value low prices and a variety of high-quality cars and trucks, Peake Chrysler Dodge Jeep Ram Fiat is the first and last place you will need to shop for a new or used vehicle. We carry everything from Chrysler, Dodge, Jeep, Ram, Fiat to Fords, Chevy, Toyota, Honda, and many more! Please confirm the accuracy of the included equipment by calling us prior to purchase. Blue Streak 2019 Ram 1500 Classic Express 4WD 8-Speed Automatic HEMI 5.7L V8 Multi Displacement VVT Vehicle is equipped with: Express Black Accent Package (Black Exterior Truck Badging, Black Headlamp Bezels, and Wheels: 20" x 8" Semi-Gloss Black Aluminum), Express Value Package (1-Year SiriusXM Radio Service, 40/20/40 Split Bench Seat, Charge Only Remote USB Port, Cloth 40/20/40 Bench Seat, For More Info, Call 800-643-2112, Front Armrest w/3 Cupholders, Manual Adjust Seats, Media Hub (USB, AUX), Radio: Uconnect 3 w/5" Display, Rear View Day/Night Mirror, SiriusXM Satellite Radio, and Temperature & Compass Gauge), Quick Order Package 27J Express (17" x 7" Aluminum Wheels, Body Color Rear Bumper w/Step Pads, Delete Spray In Bedliner, and Front Fog Lamps), 17" x 7" Steel Wheels, 3.21 Rear Axle Ratio, 3.92 Rear Axle Ratio, 4-Wheel Disc Brakes, 6 Speakers, ABS brakes, Active Grille Shutters, Air Conditioning, AM/FM radio, Anti-Spin Differential Rear Axle, Auto-dimming Rear-View mirror, Brake assist, Delay-off headlights, Driver door bin, Dual front impact airbags, Dual front side impact airbags, Electronic Shift, Electronic Stability Control, Front anti-roll bar, Front Center Armrest, Front wheel independent suspension, Fully automatic headlights, Heavy Duty Vinyl 40/20/40 Split Bench Seat, Low tire pressure warning, Occupant sensing airbag, Overhead airbag, Passenger door bin, Power steering, Radio data system, Radio: 3.0, Rear anti-roll bar, Rear step bumper, Speed control, Tachometer, Tilt steering wheel, Tip Start, Traction control, Trailer Brake Control, Variably intermittent wipers, Vendor Painted Cargo Box Tracking, and Voltmeter. At Peake Chrysler Dodge Jeep Ram FIAT we believe that success is a satisfied customer, and profit is a by-product of hard work.